Encouraging news indeed. Southern California though, has seen a reduction in numbers according to The Xerces Society article: "Less positive is that in southern California, the majority of the sites surveyed had fewer monarchs than last year." 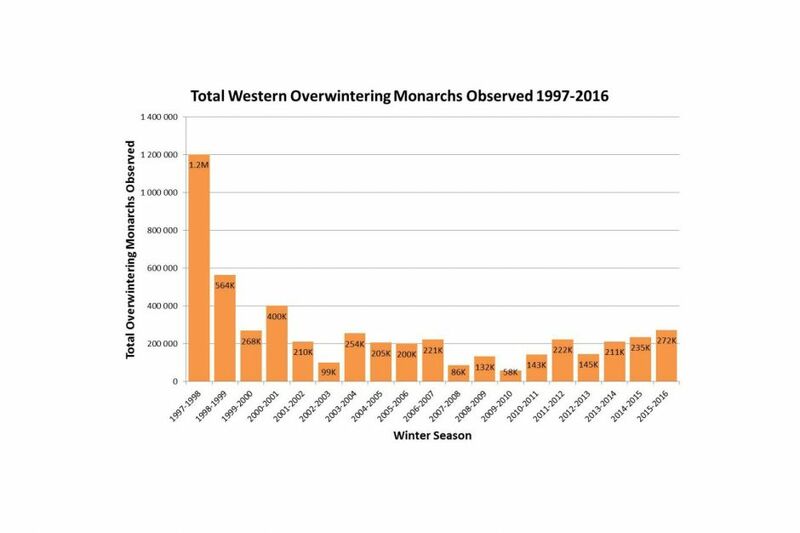 What is shocking when looking at the graph is the plummeting numbers between years 1997 and 1999. The Container Butterfly Garden has been wheeling and dealing like it never whelt and dealt before, exchanging plant seeds of late with like-minded souls. 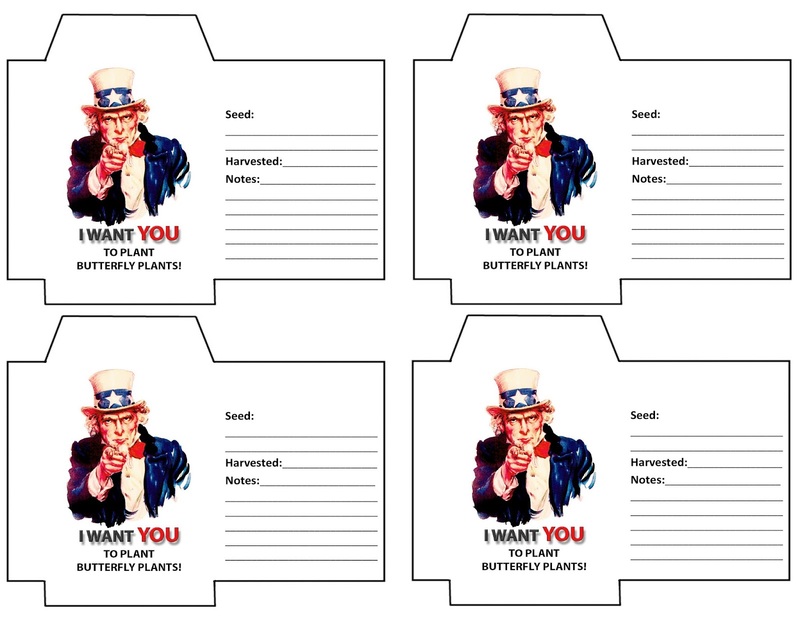 So, I got an idea (dangerous) of creating and designing a custom seed packet to share and exchange seeds with, which can also be used to store seed in. The Container Butterfly Garden is offering a ZIP file containing two printable PDFs: one for small packets, the other is a large packet. Click on Seed Packet Templates if you wish to use them too. 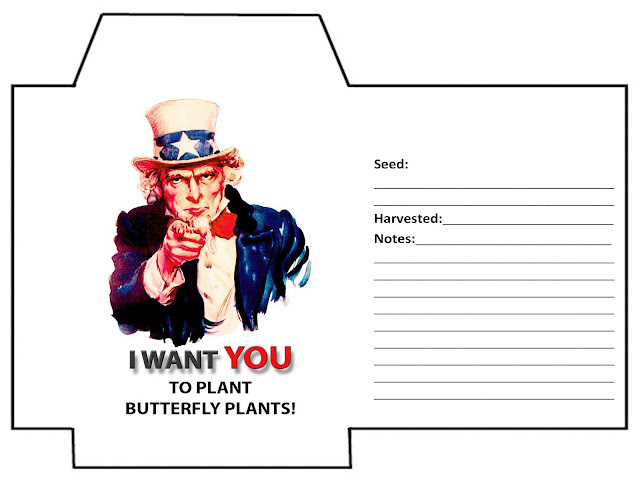 "I WANT YOU TO PLANT BUTTERFLY PLANTS!" Print on a 8.5x11 sheet of paper (size A4 for Euros). Cut just inside the black outline, fold, and then glue. Fold the bottom and side tabs in, using a ruler or straight edge to get a crisp fold and glue the tabs together where they overlap each other, making sure you don't glue them to the inside of the front panel. Next, add a bit of glue to the tops of both folded tabs. Thirdly, fold the back side over, align and press: TA-DA! A little tip when sending seed via mail: if using a regular envelope, place seed in bubble wrap to protect them from possible damage by postal automated sorting machines, or at least wrap them in a paper towel folded over several times. Small manila cushioned mailers work great too.